These days participating in social media such as Twitter, Facebook, blogging and more is almost required for any entrepreneur or business, small or large. This is my small blog on diabetes. You can also subscribe via email or rss. Find a link to older stories at the bottom of this page. This is my small blog on physical activity and nutrition relevant for patients. You can also subscribe via email or rss. If you would like to know how the different topics are connected please see this diagram. It is helpful when chosing what topics to subscribe to in case you would like to avoid reading the same stories more than once. This is my small blog on skin cancer and sun protection. You can also subscribe via email or rss. The first 6 topics are automatically included in the topic “Nutrition and obesity”. Likewise “Environment” and “Playgrounds” are included in “Physical Activity”. You can subscribe to “Nutrition and obesity” and “Physical Acivity” here. See Sub topics overview for a complete picture. I also maintain simple blogs on Diabetes, Nutrition and physical activity related to patients and Skin cancer. 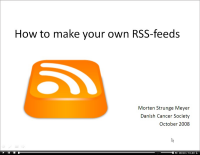 I prepared an 11 minute screencast explaining how I use pubmed.org, google reader, delicious.com og feedburner.com to produce my RSS feeds. Watch my screencast now. I made the screencast using Camtasia.